What is Puracyn® Plus Professional Formula? 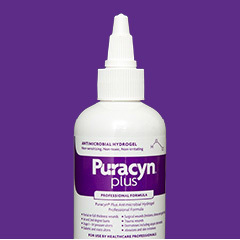 - PuracynPlus Professional Formula A next-generation solution for optimal wound bed preparation. The Puracyn Plus Professional Formula Family of Products provides an economical tool for all types of wound care. Based on an advanced hypochlorous technology, the Puracyn Plus Professional Formula Family of Products provides clinicians with a portfolio of products made specifically to enhance and streamline wound care protocols. 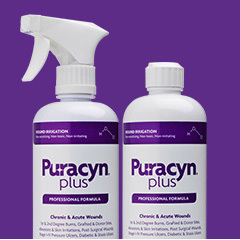 Puracyn Plus Professional Formula products contain hypochlorous acid, a known antimicrobial, which serves as a preservative to inhibit the growth of microorganisms within the products. Hydrogel dressings are covered when used on full-thickness wounds with minimal or no exudate (e.g. Stage III or IV injuries). Hydrogel dressings are not usually medically necessary for Stage II injuries. Documentation must substantiate the medical necessity for use of hydrogel dressings for Stage II injuries (e.g. location of injury is in the sacrococcygeal area). Usual dressing change for hydrogel wound covers without adhesive border or hydrogel wound fillers is up to once per day. The quantity of hydrogel filler used for each wound must not exceed the amount needed to line the surface of the wound. Additional amounts used to fill a cavity are not medically necessary. Documentation must substantiate the medical necessity for code A6248 billed in excess of 3 units (fluid ounces) per wound in 30 days. Use of more than one type of hydrogel dressing (filler, cover, or impregnated gauze) on the same wound at the same time is not medically necessary. DISCLAIMER: This information does not guarantee reimbursement, but provides guidance for accurate documentation and appropriate usage for hydrogel wound filler. Should you need further assistance or have specific coding questions, please contact your regional DMERC or intermediary. It is the manufacturer’s intent to share this information with healthcare professionals to highlight awareness of the reimbursement process. Innovacyn, Inc. is dedicated to improving wound management outcomes across the world. Family-owned and operated, everything we do is inspired by this vision. From hand-building our facilities and growing a dedicated team, to delivering the highest-quality products, every step of our process is made with the power of change in mind.